Are you in search of the best electric knife sharpener to enhance your kitchen’s efficiency? Are you the one who is looking for a proper guideline to purchase a suitable knife sharpener? If yes, then you are knocking at the right door! Here you’ll get everything you need to know about electric knife sharpeners. If you haven’t enough time for reading all of the reviews, then check out my top rated knife sharpener for you. You know how important a sharp knife is to kitchen cutlery. Working with a blunt knife is not safe, it may damage vegetables and change its appearance & taste, even a blunt knife is more prone to slippage that may result in severe injuries. So, there is always a need of the knife sharpeners. Thankfully, advanced technology has taken us from the tiresome manual kitchen knife sharp﻿﻿ening method to an upgraded & automatic one. Are You in A Hurry? Then Check out my suggested sharpener which is better for any kinds of knives. √ Speedy & precise method. √ It has 100% diamond abrasive that never deteriorates. An electric knife sharpener takes maximum 2 minutes to sharpen a blunt knife. The process finishes within 30 seconds if just a touch up needed. A huge collection of different types is available there in the market. In order to pick your electric knife sharpener, you must go through all the categories carefully. Some of them pull double duty and offer both the services of sharpening and honing. Different brands use different sharpening agent but most of them prefer diamond plates as sharpening agent. Ceramic, titanium and tungsten carbide are the other material used in the newer model of sharpeners. Although a lot of electric knife sharpener reviews suggest that sharpeners with diamond plates create the sharpest edge with great precision. 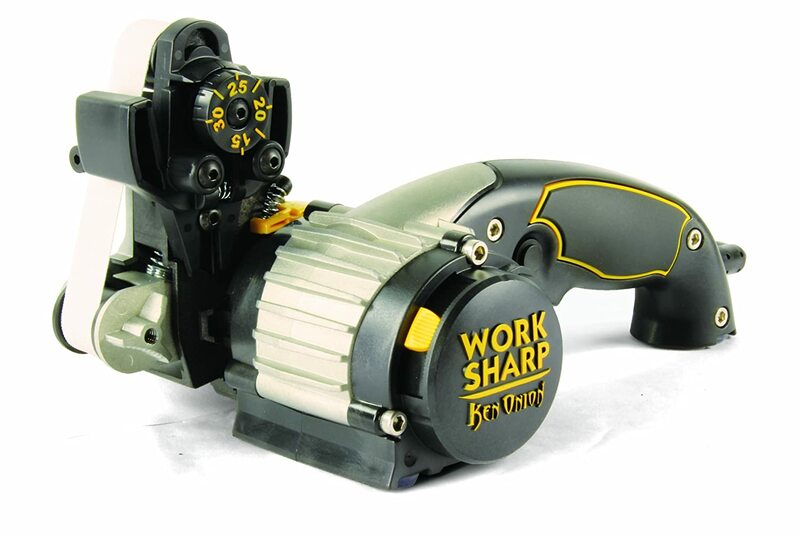 A double sided sharpener is a far better choice than single sided sharpeners because it is specific and much quicker. 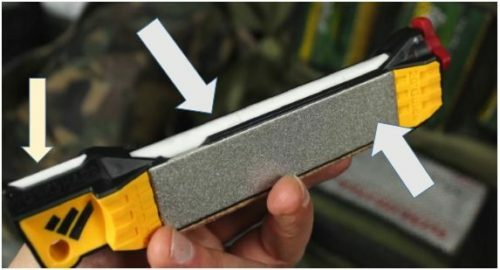 An automatic knife sharpener will have the ability to sharpen household items like razor blades, axes, gardening tools, lawnmowers and scissors other than just the knives. A sharpener offering a variety of angle settings to adjust your knives perfectly is definitely worth looking for. Remember that only a few high quality sharpeners are capable of sharpening all types of knives including butcher, fillet and serrated ones. You should know about your needs of owning a knife sharpener. You don’t need a professional knife sharpener if you rarely use kitchen knives for household works. 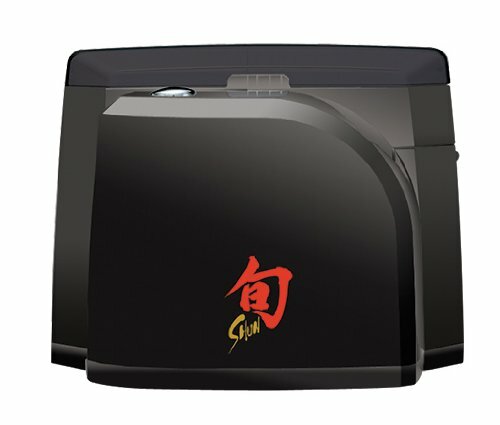 But if you are frequent user, you must go for the electric knife sharpener that allows customization and works with all knife types. You mustn’t compromise with the quality and only a reputed brand can ensure high end performance with a variety of features. There available a bunch of brands for you to choose. AnySharp, Andrew James, Judge & Chefs’ Choice are the most reliable brands in the industry. These brands offer a wide range of products to meet all your knife sharpening needs. For example, ‘Andrew James’ features electric knife sharpeners with two-stage adjustment and honing facility, the products of the brand ‘Judge’ also offer sharpening of household items like sewing scissors. The ‘Chef's Choice’ produces more durable sharpeners with all the valuable features including diamond plate, 2-step sharpening and honing. ‘Stage’ is a crucial factor for knife sharpeners. Most of the models have only 2 stages but only the best ones have 3 or 4 stages. These three to four stage models are used to hone the edge finely and sharpen blunt blades rapidly. Be very careful to choose 1 stage models because they shorten the life of your knives by removing metals unnecessarily. They are fairly course too! The one stage models are perfect for utility or pocket knives. It must have diamond plating as sharpening agent. 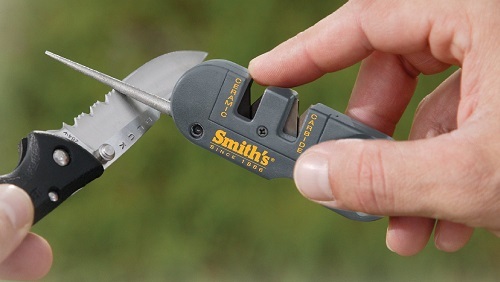 Don’t select 1-stage sharpener unless you are using pocket or utility knives. You have so many choices available when it comes to knife sharpeners. To get you rid of this problem, here in this section we will be highlighting our top 5 professional electric knife sharpener. We have carefully picked the models that are reliable, fast and efficient. We sorted out these 5 best products depending on their sharpening disk types, holding system of the blade angle and overall performances. The Chef's Choice 120 is rated as top rated electric knife sharpener that allows sharpening for both straight and serrated knives. With numerous features and an affordable price range, it has already won the hearts of many consumers. This product is highly recommended by professional chefs and cutlery experts all around the world too. The Chef’s Choice Diamond Hone 120 is a durable model and it makes the sharpening process quick and really smooth with built-in chaperones. You will also have the facility to customize the knife edge setting according to your needs. The accurate installation of springs and angle guides guarantees a properly sharpened knife eliminating the guesswork. It delivers the versatility to sharpen a wide range of knives like butcher knives, sporting knives, chef’s knives, gourmet knives, serrated knives and pocket knives. The first two stage is 100% diamond abrasive. Stage one is the coarse stage which is used for restoring and repairing damaged blades. Stage two sharpens and refines the edge. Stage three uses a flexible stropping disk for stropping and fine polishing. ​Uses Trizor-Plus edge for superb sharpness. 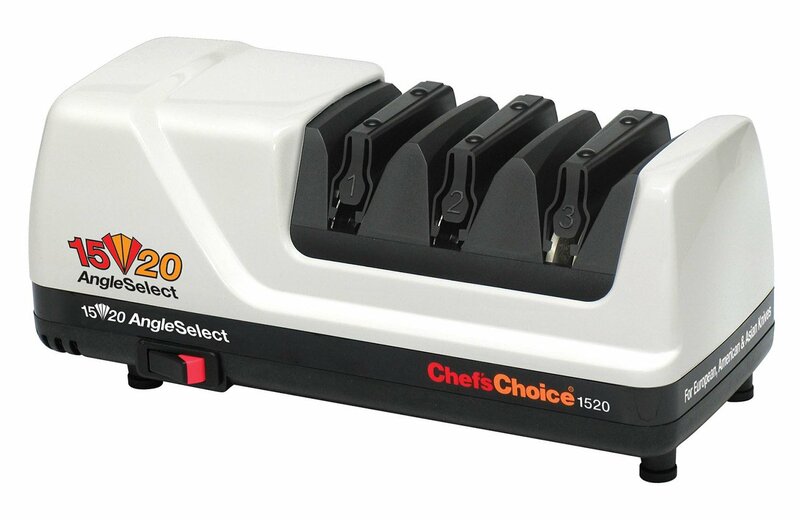 The Chef’s Choice 1520 Angle Select is a dedicated sharpener that performs its job most efficiently. The high quality diamond abrasive disks, flexible stropping and packed full of advanced features have made it an ultimate choice for the consumers. This model has earned the most appreciation according to many electric knife sharpener reviews and opinions of the enthusiasts. And why not?? Chef’s Choice is a renowned brand and it always delivers quality products and the 1520 is one of their very best. It offers multiple angle options and you can sharpen any types of knives including Japanese, European and American. 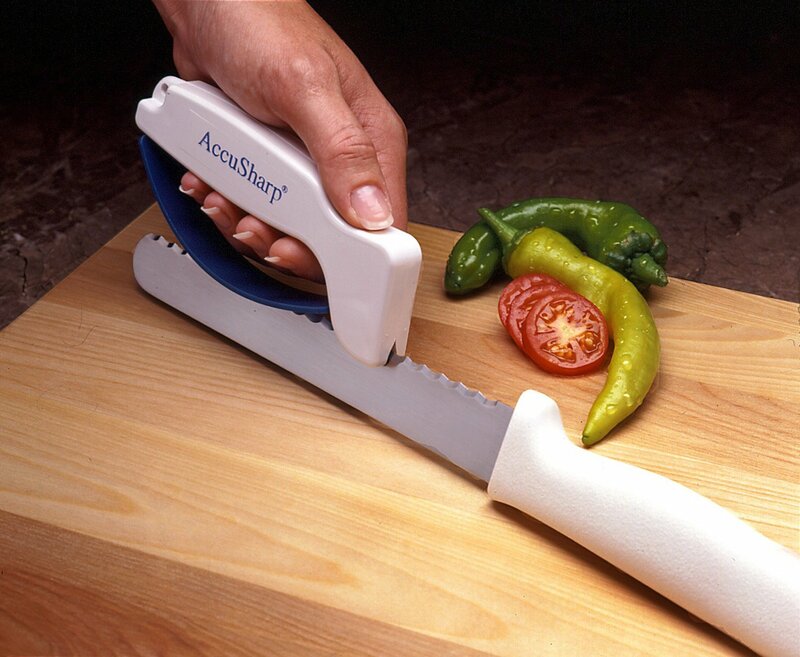 Most importantly, it can also sharpen knives that have double-beveled edges. It also has three stage sharpening enabled. Sets up 15-degree angle on Asian style and 20-degree on European style chef’s knives. The first stage is course and second one is fine. The last stage is for polishing. The first stage should be used for dull knives and the third stage for serrated ones. This commercial knife sharpener works well with survival knives, kitchen cutlery, pocket knives, sporting and butchery ones. This knife also fits into the category of electric knife sharpener for global knives. Not God for pocket and hunting knives. 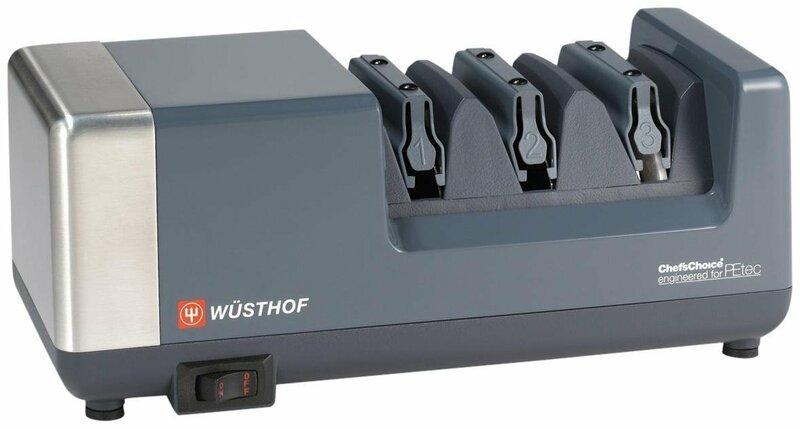 Wüsthof is a traditional and world famous brand that only produces high quality products with great performance and durability. The features, design and affordability of this kind has caught our attention and that’s the reason we have highlighted it on our top 5 list. It uses PETec technology to restore the sharpness and extend the lifespan of the knives. It’s 100% diamond abrasive wheels are ideal for polishing and realignment of dull knives. The technology used here ensures that your knife will never sacrifice its longevity in the process. You’ll also like the design, the mixture of gray and silver housing gave it a contemporary look. 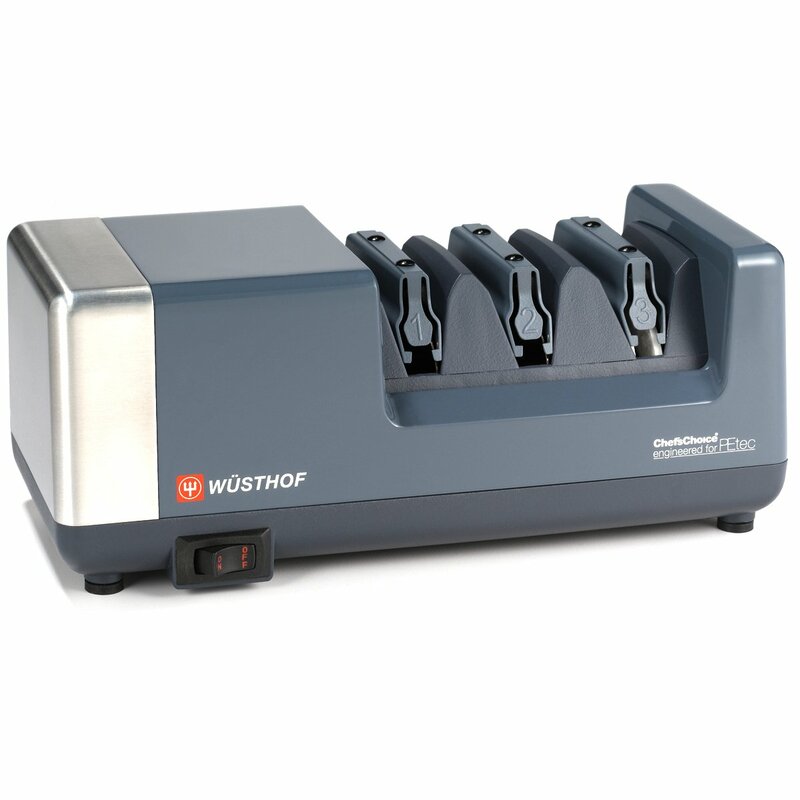 It features three sequential and individual slots advanced sharpening. 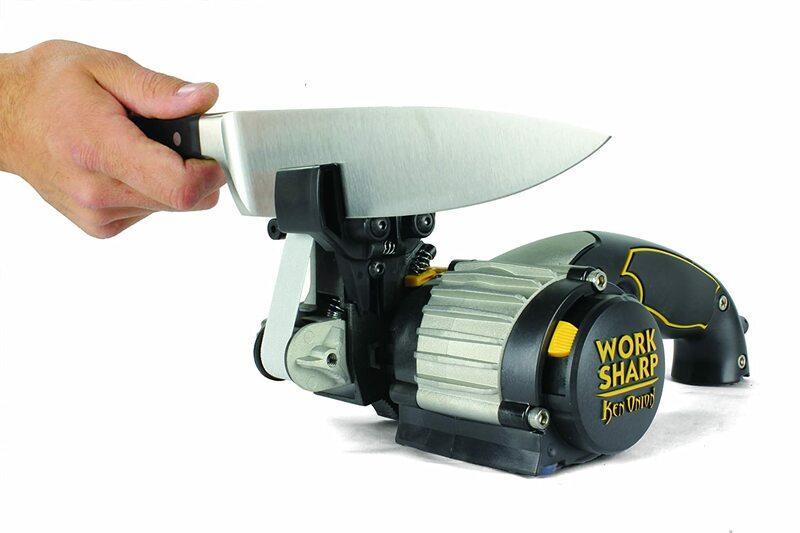 This motorized knife sharpener can provide up to 14 degree PEtec and a combined 28-degree edge. ​The model results in ultra-sharpness and might be too sharp for hunting, pocket and camping knives. ​Stage one can create a new edge sharper than factory edges. ​The performance of the other two stages is almost same as the other models stated above. ​The only difference in this case is the stage 2 that uses finer diamonds. It allows a smooth and refined preparation of the blades for the next stage of honing. ​It is also better for fillet knives too. Not good for serrated knife. 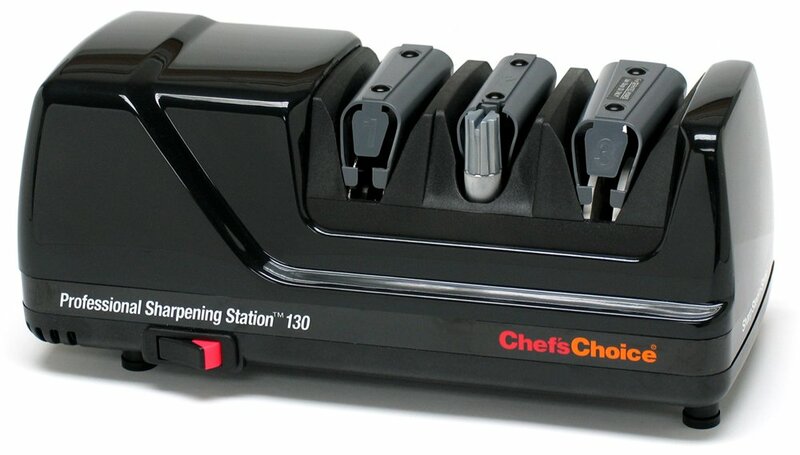 The Chef’s Choice 130 is one of the easiest electric knife sharpener to operate compared to other available products in the market. You will get the hang of it as it will leave excellent edges on to your knives. It has the capacity to sharpen every straight and serrated edge knife blades. To sharpen the edge of the blades, the first stage uses 100% diamond abrasives. The second stage develops the blade by making it extremely hard and super sharp. And, of course, the last stage is for the fine polishing and a smoother touch. As it is a Chef’s choice product, there is no compromise with the quality. You can undoubtedly rely on this razor sharp knife sharpener. The features are promising and this handy sharpener is affordable too! For the quickest & sharpest edge, it offers three stage of sharpening. Available with a flexible stropping disk. Doesn’t remove too much metal from the knife. Comes with an elastomeric angle guide. Too much pressure may damage you sharpness. 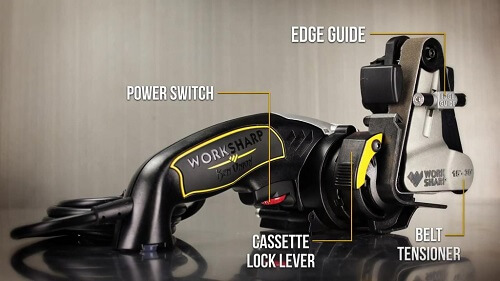 Work Sharp WSKTS - KO is a multipurpose knife sharpener, you can sharp knives as well as tools with this one. This Ken Onion designed sharpener is a stylish and easy-to-use machine for those who wants sharp blades for their knives or tools. This best knife sharpener for the field weighs only four pounds and the dimensions are (5.5X10X6) inches. Because of the light weight and smaller size, you can carry this thing along with when you are on the move. This is also a great option for both straight and serrated knives. You can achieve quick and repeatable results for almost all types of knives. For a solid performance, it is designed with polymer and cast metal. It is tough device and it will last long. Though some of the users have faced some issues with the motor, most of the users are satisfied with the performance. Size is different than others. Why I Have Chosen Chef's Choice for Three Times?? According to user reviews and professional tests, chef’s choice is by far the best in the business. They maintain the standard of the quality every time they produce a new model. 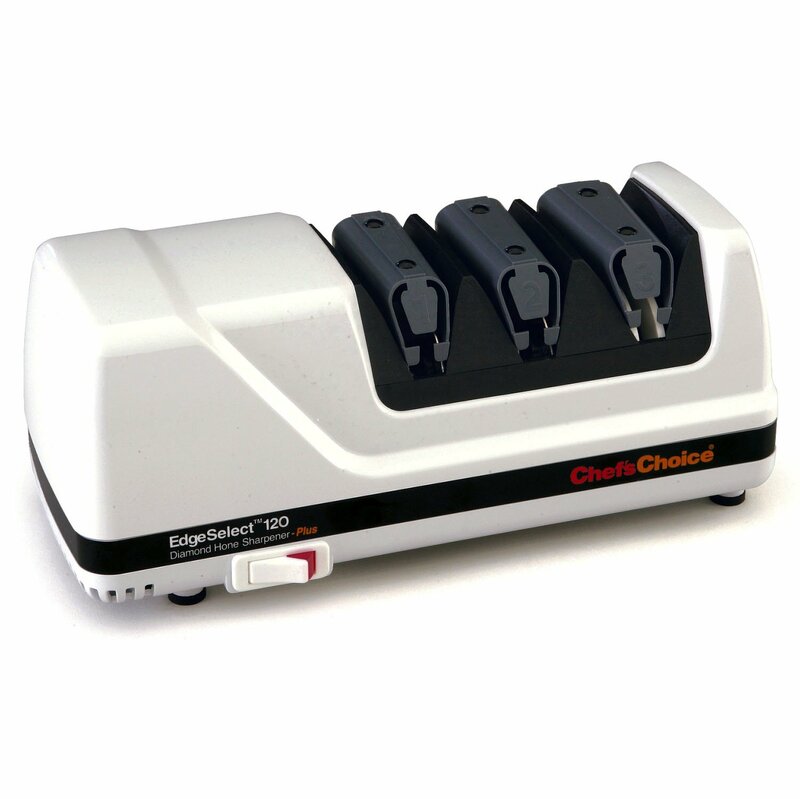 There are so many models available for chef’s choice electric knife sharpener for different purposes. 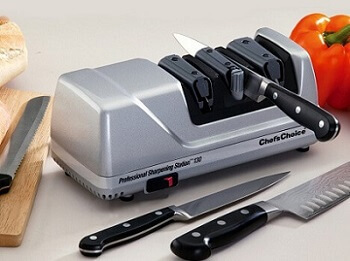 You’ll find all the required qualities in any model of chef’s choice sharpener. Apart from this, all the chef’s choice products are assembled in the USA and they also offer 2 years’ warranty with proper use and care. 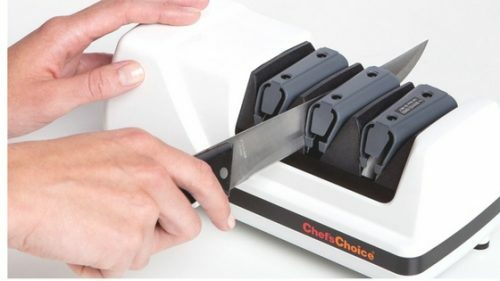 Chefs Choice knife sharpener review suggests that you may also be able to control the total number of sharpening on each side even if your knife is crooked. 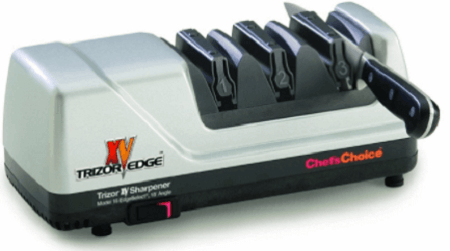 We have discussed the 3 best categories of Chef’s Choice sharpeners above. Still we want to point out a few other model of this same brand that has prospect. Chef's Choice 110﻿ - A bit straightforward and a perfect European style cutlery. 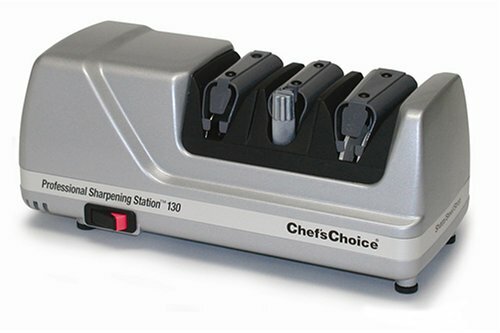 Chef's Choice 320 - A smaller unit that provides light sharpening. It's affordable too. As like every other category, there are specific sharpeners for kitchen knives that work best for them. While choosing the best kitchen knife sharpener you must select the ones that are easy to operate and convenient for storing. Dicing, cutting and coating are the basic functions of a kitchen knife. If not taken care properly, these knives might wear out and the edges will become dull. A blunt knife is very risky for kitchen, they are likely to get slipped off and you might cut your fingers unintentionally. Even the taste of the food gets changed sometimes due to improper cutting. If you are a restaurant chef, you’ll definitely want to have a razor sharp knife and a razor sharp knife sharpener always at your disposal. Mainly because of their great sharpening speed, electric models should be your first priority while purchasing kitchen knife sharpeners. Pocket knives are crucial when you out there surviving in a forest, or camping on a deserted island. A sharply-edged knife is an asset while travelling, on the other hand a dull knife will invite trouble in certain circumstances. Sharpening your knives with stone is a time consuming process and many of us don’t know how to do it properly, even finding a natural sharpening stone is a hassling process. In that case carrying as sharpener with you will be the best solution. But, carrying an over-sized and heavy knife sharpener will be a burden and that’s when you need a pocket knife sharpener for your pocket knives. They are compact, portable and gets easily fitted on your pocket. Hunters or survival knife owners prefer manual process than automatic because it gears them up when they sharpen their knives with their own hands. However, choosing an electric knife sharpener for hunting knives might solving your problem. Which Is Better for Asian / Japanese Knives?? Each type of knife is different than each other. For example-the Japanese knife blades are sharpened at a 15º angle whereas the western style knives are sharpened at a 20º angle. Japanese knives need more frequent sharpening than any other category. As the market is flooding with a wide variety of products of different makes and models, it is very difficult to find the best knife sharpener for Japanese knives. • It must have a durable and robust construction. • Operating procedure should be easy and user friendly. • It should have at least 2 stages, getting 3 stages will be a bonus. This model is equally good for Western and Japanese knives. It has 15 to 20-degree angle adjustment ability. The model is affordable an d takes less space. This model offers 3 stages for an ultimate sharpening performance. The blades will remain sharper for longer periods honed by this machine compared to other single stage contemporaries. Now, this one offers 14 degree sharpening angle which is pretty close to that required mark, still if you want perfection, you better skip this one. Its performance is almost same as the ones of Chef’s Choice. With three stage and extremely fast operational functionality, it is one the best available option. The Shun AP0119 is the best knife sharpener for shun. This is an awesome product by a great company. However, you’ll get only one stage and that is the major drawback. It will take more time to sharpen a dull blade and sometimes excessive metal may wear off during the procedure. Another interesting factor is that you would have removal sharpening disks for later cleaning and replacement. Yes! It is possible. You can get knife sharpeners as cheap as $100 with useful features. As they are cheap, you need to be perfectly sure about the features they are offering. Not only that, they should be meeting all the requirements accordingly. Another thing, these sharpeners should work well with different knife categories. You can get both manual and electric knife sharpeners under hundred-dollar budget. But, we would recommend you to electric sharpeners because they are fast, versatile and provide both fixed and adjustable angle. Hopefully you would get some suggestions and you already know how to pick the best product. How to Use Knife Sharpeners?? To get the best out of your best home knife sharpener, you must know how to use it properly. Let’s give you some basic idea first. An electric sharpener normally has 2 or 3 grinding wheels with different coarseness. When honing a knife, you should start with the coarsest one and then move to the finer ones. You’ll get this information from the user manual. » Place the knife into the slot first and push it down as far as possible and stop when it reaches the grinding stone. » It’s time for drawing now. The slot will hold the knife at 15° – 20° angle (approx.) and at the time of pulling through the handle will also angle up a bit. » Make 2 passes at least one each side for reshaping. » Once your blade is sharpened, use the fine-grit stone if any re-honing is required. What Is the ﻿﻿Best Angle to Sharpen a Knife?? Selecting an angle is probably the easiest as well as the most important stage in sharpening. For most of the knives a 20-degree angle will do just fine unless you are too much concerned about the fine tuning of the bevel angle. Select a larger angle if you want a durable edge as lower angle provides less durability. The sharper your knife becomes, the more you low down the angle. The diagram below will give you some idea about choosing the right angle for your electric knife sharpener. How to Maintain the Sharpener?? Cleaning is required when the performance of the sharpener deteriorates. For a better outcome it is better clean the machine once a year. • Some model like Chef’s choice 130 has a specific dressing tool to perform cleaning tasks. You would get the detailed info on how to clean described in the user manual. • The cleaning process varies from brand to brand. So, we won’t go more details in this topic. Some models support manual cleaning process. Dullness occurs due to corrosion. Yet there are many reasons that are responsible for the dullness of the knives. 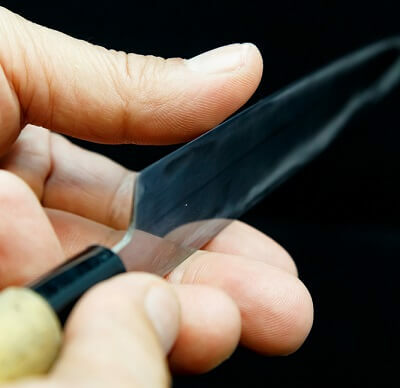 Knives tend to damage if you perform tasks like scraping, opening tin, slicing heavier items or crushing ice. Sometimes cutting acidic fruits and vegetables causes corrosion in the blade. Even washing the knives with harsh chemicals or keeping it in high temperature may bring drastic effects to your cutlery. • Avoid heavy wooden cut boards while cutting. • Select appropriate knife for any task. 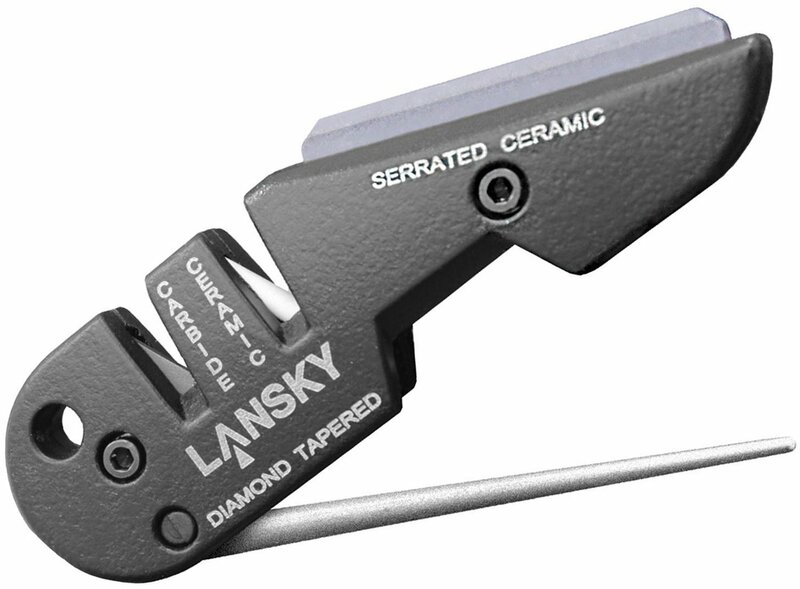 • Perform fine sharpening to repair bending. • Regular maintenance is required. How Much Pressure Is Required for an Electric Sharpener? Knowing how to apply appropriate pressure is a prerequisite to operate an electric knife sharpener. The sharpening process is almost same for all kinds of sharpeners. The rule is to never operate a sharpener from the backside, it should be done equally on each sides. You only have to exert the amount of pressure that ensures consistent contact of the blade with the abrasive disks. Checking the burr on the blade is equally important. Normally a burr will be present on the right side of the blade if your last pull is on the right slot. In order to check the burr just place your finger on the flat part of the blade and slowly move towards the sharpened edge. If there is any burr, you’ll feel a lopsided area on the edge. It is a good indication and you should go for the next stage after getting that. If you don’t find any burr, then you have to perform a couple of pulls more in the stage and proceed to the next step. Just remember to start from the flat side and move finger down while checking the burr on the blade. Best home knife sharpener consists of two kinds- Electric and Manual. It takes continuous practices for a general user to reach the proficient stage. Let's discuss some similarities and dissimilarities between the 2 types. Let's bring you a showdown of electric knife sharpener vs manual knife sharpener. • DMT FSKF Diafold Serrated Knife ﻿﻿Sharpener. There are several methods of sharpening serrated knives and not every models can sharp them. You have to be sure by checking the user manual guide. For a slight touch up you can use the last stage of any electric sharpener. Other methods like using a steel, manual sharpening kit, dowel rods & sandpaper or round tapered sharpening rods are also helpful. See 5 sharpening steel for honing your knives with a short time. In the categories mentioned above you’ll find tons of product suggestions for best knife sharpener for serrated blades. How to Sharpen Kataba Blades? Kataba blade sharpening style is little bit different. These blades need a little attention than other. Only one side of the blade edge is beveled and has a sharpened appearance, the other side is completely flat. So, first identify the beveled side in order to sharpen your kataba blade with a knife sharpener. Use stage 2 to normally steel this beveled side of your kataba blade. When sharpening the non-beveled side apply less pressure so that the side barely touches the steel. This slight touch up process is done just to maintain the overall blade alignment. The necessity of a knife sharpener started since stone age and still it has its importance. But, of course the sharpening mode is changed, now people prefer fast and accurate methods. A good electric knife sharpener has everything you want in a latest honing medium. Now carrying out cutting tasks will be easy & fun. Why don’t stop thinking around and give it a go. We bet, you won’t regret!! 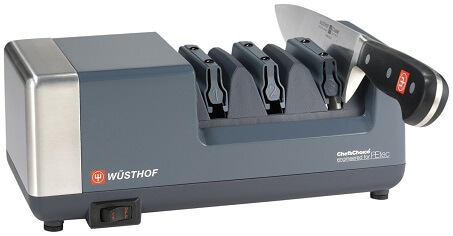 Saved as a favorite, I really like these knife sharpener and will buy one as early as possible! I hope you’ll be benefited. You’ll get a pop up email subscription when browsing. If you didn’t get this, then give your email in the email box or mail me, please. That makes two of us. 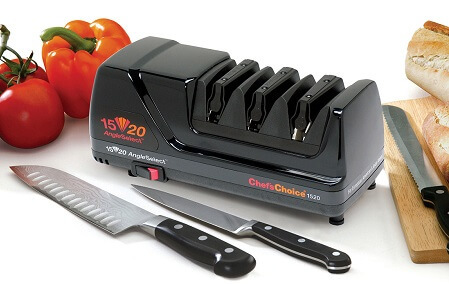 But I got my best knife sharpener which is Chef’s choice 120. Thanks for helping us, Monique. That’s obviously good for your knives. Thanks for buying it. I’m using chef’s choice 120 and lansky stone for Damascus Steel knife and kitchen knife. IS it okay, Monique? Anyways, thanks for sharing with us. I was really confused about what to buy as there are so many variants in the market. Thanks, Monique for making my job easy. Thank you, Quinton. Follow my all articles. Thank you, Bob. Send me your opinion after using. Is there any necessary to reinstall the sharpener if it gets decoyed? Or I just need to buy one again? Actually sharpeners are meant to be lasting for a long time and you don’t need reinstall anything to continue that period. After that you may buy a new one when current one becomes old. Hi, Kimer. It is a very important question. I think you should go for the knives that have a larger cutting edge so that you will find ease to sharpen. I hope it will help you. Hi, Jenny. Thanks for your opinion.